Are you aware of the DANGER lurking in toys? A social media page of a popular apartment complex in Bengaluru was recently in an uproar, when the father of a f ve-year old boy posted online about a harrowing experience. His son had developed an adverse reaction to Slime, a popular jelly-like toy that he had picked up at the apartment grocery store. Soon after the child came in contact with the squishy, bright coloured material, the skin on his hands peeled off, revealing his veins— an obvious response to the toxic chemicals in the toy. Accidents such as these, sometimes have fatal consequences. Unfortunately, they are not uncommon in India. This is not surprising, given the dangerous combination of the lack of regulations that allows the fl ood of substandard toys (both imported and domestically manufactured) and poor awareness of safety issues on part of the consumers, which makes the Indian toy market almost lethal in its scope. Like any other product, toys can be deadly if they are not made according to quality and safety norms. The harsh reality, often overlooked, is that toys pose a minefield of risks—small parts (wheels, buttons) are choking hazards, toys with strings are strangulation risks, poor quality electric toys can cause burns and shocks. Toys with sharp edges and points and those with poor design or construction material are overtly unsafe. Over the past decade, another disturbing concern has emerged in the toy industry—the use of hazardous chemicals and toxic metals like lead, phthalates and cadmium—in toy manufacturing. Lead is mainly found in paint for its obvious advantages—it enhances brightness, durability and fl exibility of paint. It is also fast drying and cheap. The benefi ts stop there. Unlike for adults, there are no safe levels of exposure to lead for children. Even low levels of lead in the blood have been shown to affect IQ, ability to pay attention, and academic achievement. ● 35 per cent of the victims are under five years of age. ● 47 per cent of injuries occur to the head and face area. ● 64 per cent of toy-related deaths in 2015 were due to choking and 71 per cent of those deaths were on account of toy balls. When these dismal figures are characteristic of a mature and safety conscious market like the US, one can only take a guess about the number of these incidents in an evolving market like India. More importantly, unlike these well-regulated markets, India does not have a legal requirement for product recall of hazardous toys. Neither do we have organisations or departments—both government-driven and non-profit —that work exclusively to study toy-related accidents, promote awareness about toy safety and warn parents about dangerous and blacklisted toys. In such dire circumstances, the onus of protecting children from hazardous toys falls squarely on the parents to make informed and safe choices in their purchases. So where do you begin? For starters, think twice before you buy a cheap, bright toy off of the street, or a local fancy store, no matter how attractive or economical it may seem. The most basic step is to buy only those toys that bear some form of quality or safety certifi cation, either by an international body or independent testing laboratory. You need to look out for marks like CE, Lion Mark or a UL Toy Certifi cation Mark. You must also know how to identify genuine marks, which should have a serial number as well as the name and address of the supplier. A critical, yet simple issue, that parents are unconcerned about, is choosing age-appropriate toys. Never buy toys that are labelled as suitable for children older than your little one. This is mainly because, these toys can pose choking hazards for younger children, who tend to put everything in their mouths and have slimmer wind pipes. As we do not have structured studies to understand the nature of toy injuries in India, it may be a safe bet to regularly go through trusted websites like US Consumer Product Safety Commission, to find out what toys are dangerous for a particular age group, and keep an eye on recalled toys, lest you find something similar in India. Steer clear of obvious hazards like balloons, magnets and poorquality tricycles. 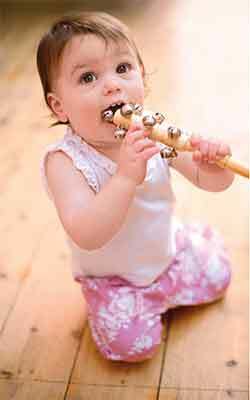 Be wary of musical toys. Select only those that comply to safety standards for sound, so that your child’s hearing is not affected by excessive noise. Plush toys should be closely examined to ensure buttons are secured well. As a final word of caution, regularly sweep your toy chest to identify and discard any broken toys that may either have sharp edges or small parts that can be swallowed by younger children. Soft toys should also be cleaned regularly to prevent allergies and infections.